Brings you premium quality spices, i.e. Mace, Green & Black Cardamom, Bay Leaves, Nutmeg and Rose Essence without any hassle. Consistent, real taste and aroma. Does not limit you from adding your signature touch. 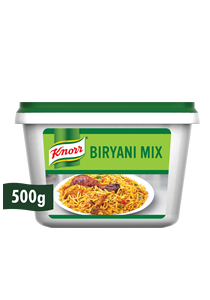 Knorr Biryani Mix is a perfect biryani base that delivers REAL Taste and Aroma to your dish every time. 1. Add 20g of Biryani Mix powder. 2. 500g rice with other ingredients to taste. 3. Cook rice till done.